I’m debating whether to make Fifty-Two Cakes into a general recipe site as long as it involves an oven. I’m also debating whether I have the energy to start another 52-week project in which I would do Fifty-Two Cookies. You tell me – do you have any interest in seeing either or both of those things? 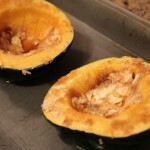 Ok, on to learning how to bake acorn squash! 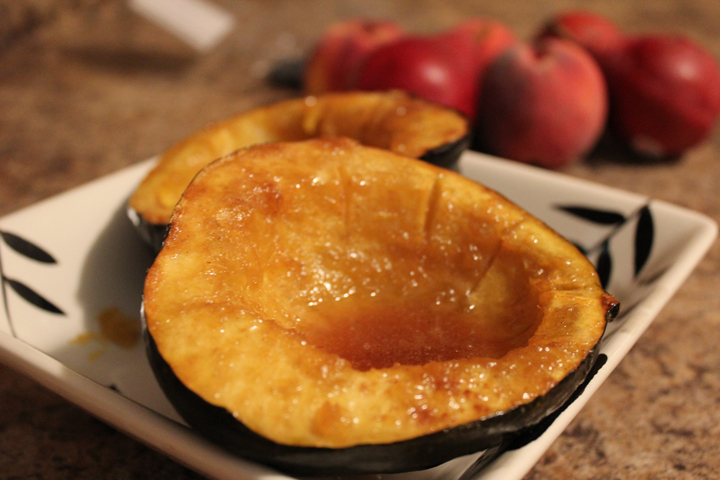 I know this is not a dessert, but sweet baked acorn squash is delicious and just sweet enough to be. I’m a member of KC Door to Door Organics, which I would recommend to anyone. I’ll blog more about it sometime. 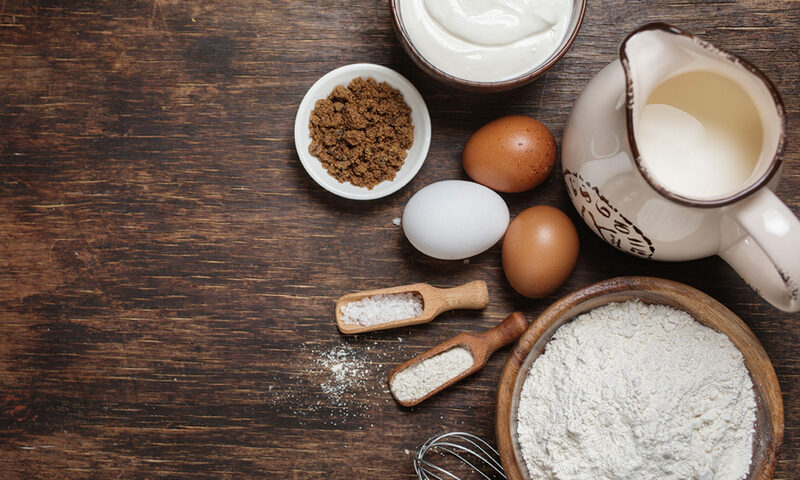 There is always an ingredient in my organics box I’m not super familiar with how to prepare, and I consider it my “challenge ingredient” for that week. The last several boxes my challenge has been eggplant. 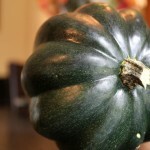 This time it was a Kansas City local acorn squash. 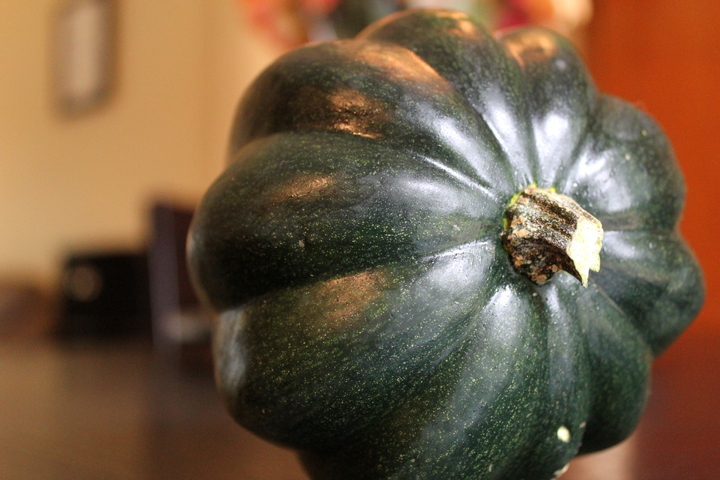 A little about acorn squash – it’s a wintertime squash that usually has a dark green skin, but apparently golden and white acorn squash exist too. It looks like a big green acorn, imagine that. Apparently you can store these in a cool, dry place (like your basement) for a month or more and they keep just fine because of their thick, tough skin. 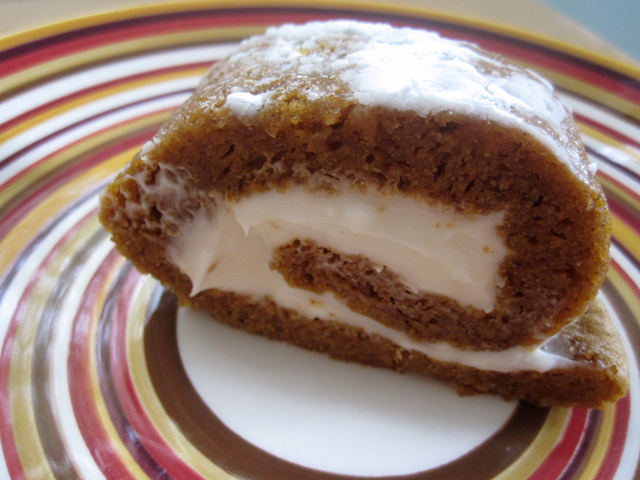 But it feels like fall for the first time this week and I just had to bake it today. 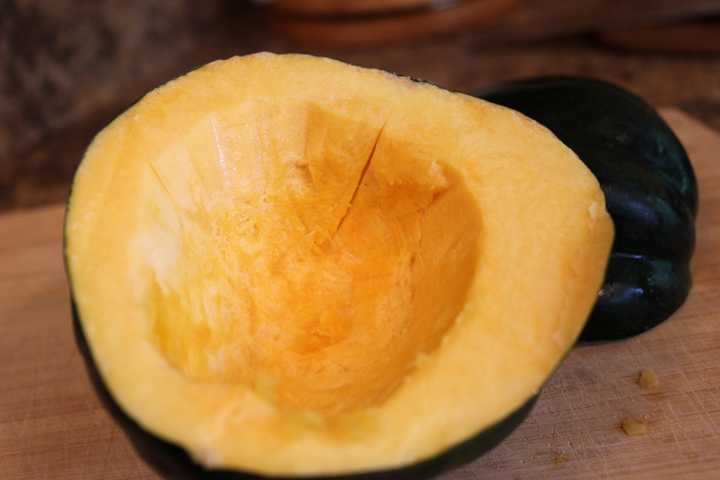 They’re pretty low calorie, a half squash with this recipe is under 150 calories. I didn’t think to bake the seeds like you do pumpkin seeds and accidentally threw them in the compost, but those are edible too. I definitely think I will plant some of these in my garden next year. It’s super easy and fast to make, the longest part is just waiting on it to come out of the oven. Preheat your oven to 400 degrees. 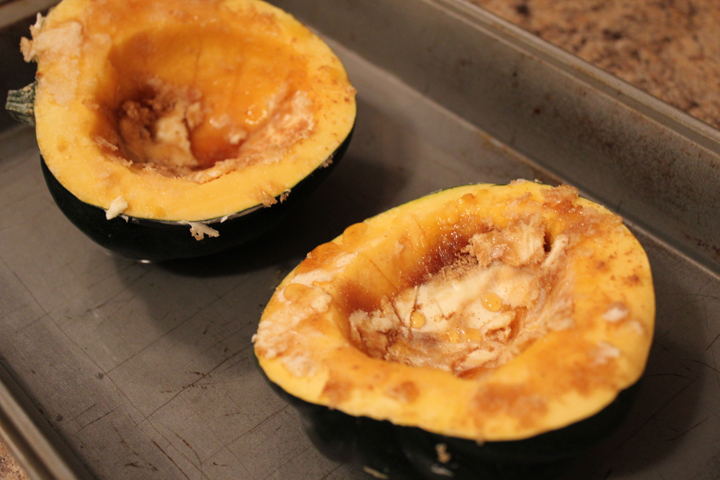 Cut the acorn squash in half. I had to use my biggest Wusthof knife and really throw some weight into it. 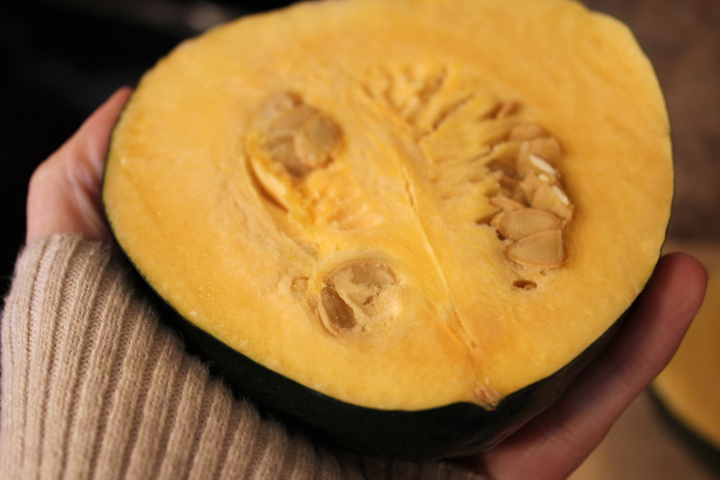 Use a spoon to scrape out the squash seeds in the center. 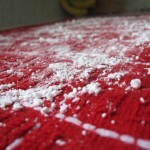 Set aside if you want to bake them separately. 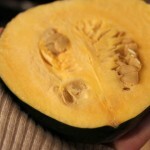 Score the squash with a knife or poke holes with a skewer (not going so far as to pierce the skin). 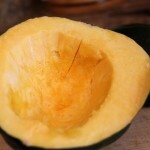 In the “bowl” of the squash, coat the yellow parts with 1/2 to a full tablespoon of butter for each side. 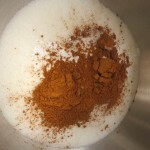 Rub brown sugar on the butter-coated parts. 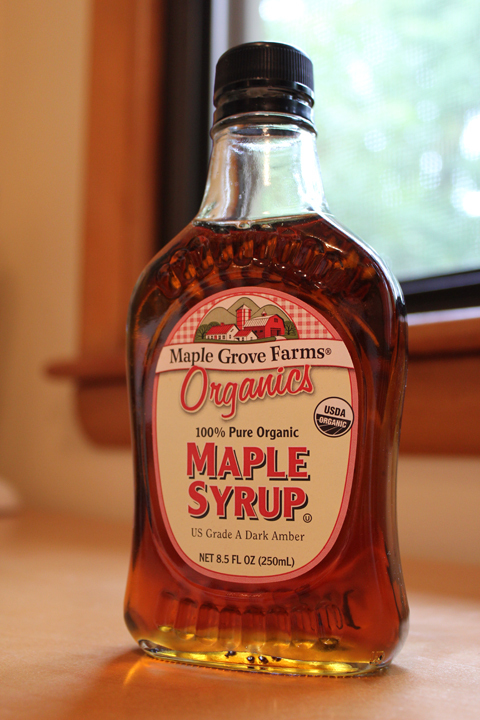 Drizzle with a bit of maple syrup (whatever you feel like, but don’t go overboard). 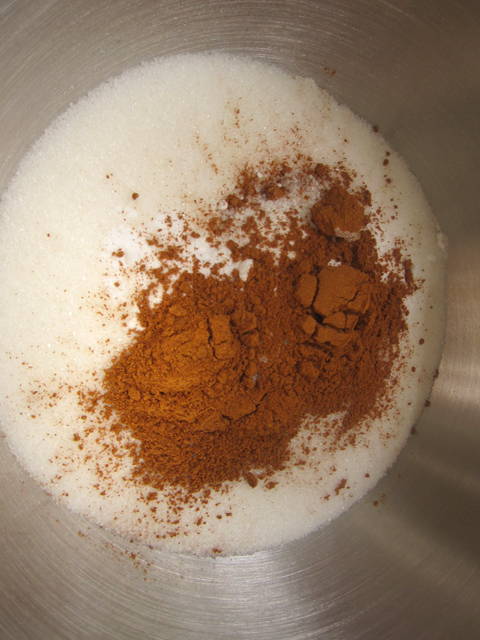 Sprinkle a dash of baking spice, cinnamon or something else tasty on there. Fill your pan with enough water that it won’t all boil off in the oven. This water will help keep the skin from drying out while it bakes. 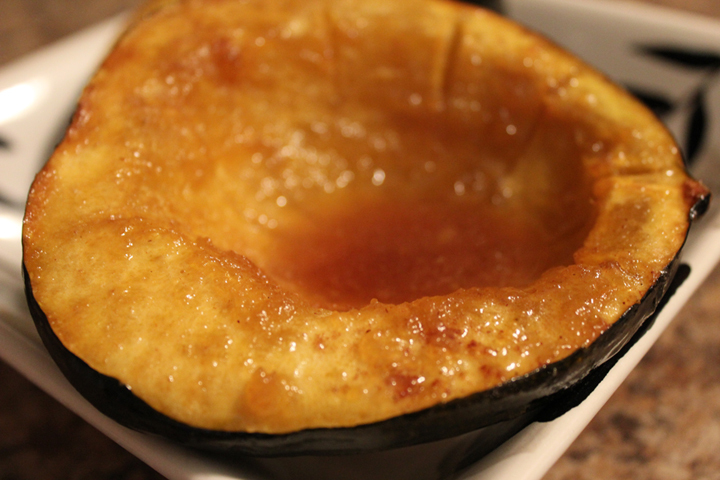 Place gooey-side up and skin-side down and bake for about an hour or more until the top is golden brown. 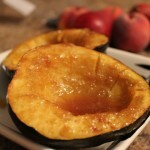 My favorite part of this baked acorn squash recipe? 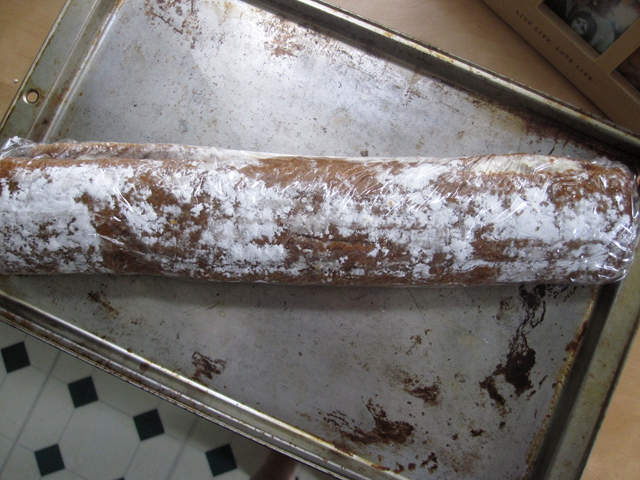 I only had to wait about 3 minutes after I pulled it out of the oven to eat it. YUM! I have tons of pumpkin stuff left over from carving pumpkins into jack-o-lanterns this year, plus one can of pumpkin puree left in my cabinet. Also, cream cheese is a staple in my house, not an extra. 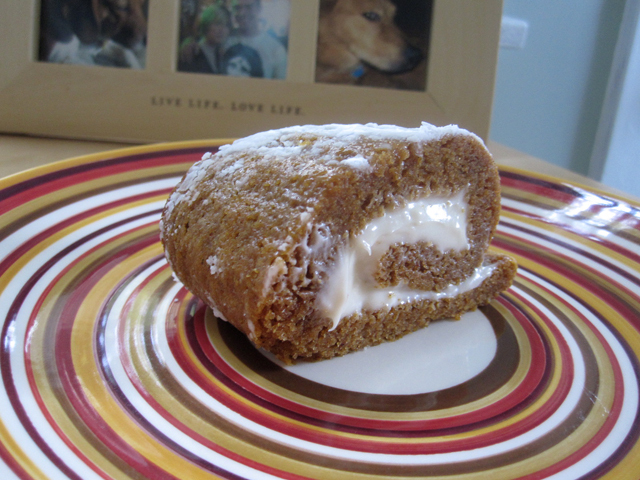 So in the spirit of the changing leaves and the beautiful fall weather here in St. Louis, I made a pumpkin cream cheese roll this weekend. 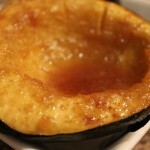 Easy little thing to make, yet very tasty and rewarding. I love the little plate I took the picture on today. 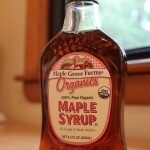 I got it at World Market. In fact, I would love to get a bunch of funky little dessert plates to take pictures of slices of the final desserts on. If you ever see any plates that make you think of me, send me a link! My husband is deployed to Afghanistan, and with that comes a certain level of stress and loneliness for the Army wife back home. The best thing for me to do is keep my hands busy. There is a real peaceful, therapeutic feeling I get from baking. When my house fills up with the warm delicious smells of baked goods rising in the oven, things are perfectly peaceful for a little while. Preheat your oven to 375 degrees. Spray a 9×13 jelly roll pan (basically a shallow casserole pan, similar to a cookie sheet) and line it with parchment paper. 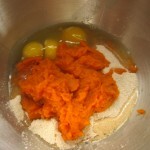 In a large bowl, mix together the flour, sugar, baking soda and pumpkin pie spice. 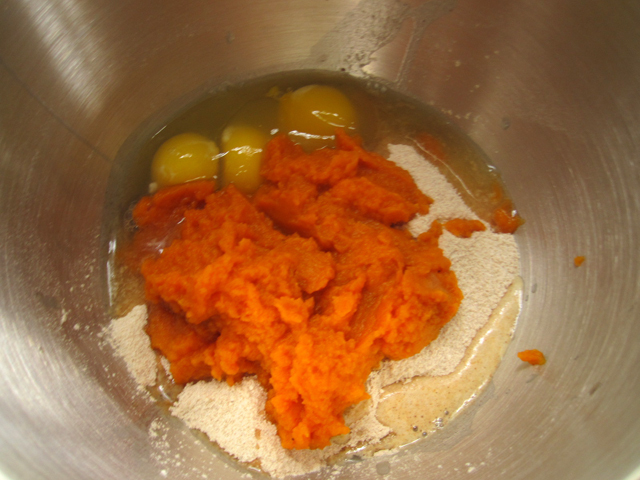 Then add the pumpkin puree, eggs and lemon juice. Pour it into the 9×13 jelly roll pan and spread evenly throughout. Bake for about 15 minutes. 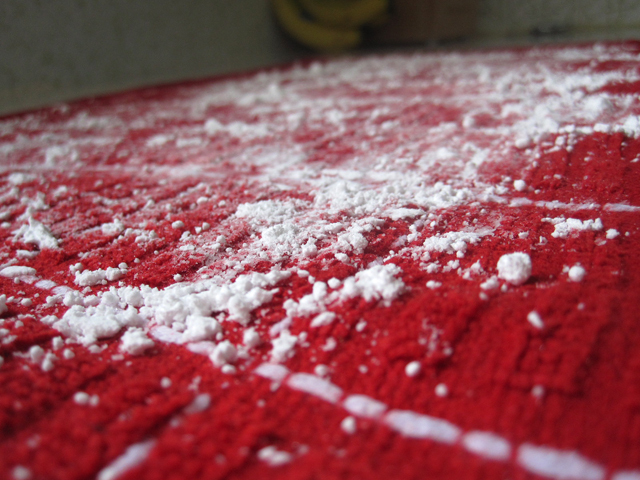 After you pull it out of the oven, get a kitchen towel damp and lay it on the counter and sprinkle it with plenty of confectioner’s (powdered) sugar. 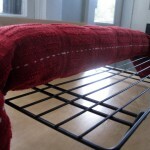 Flip the cake out of the pan onto the towel. 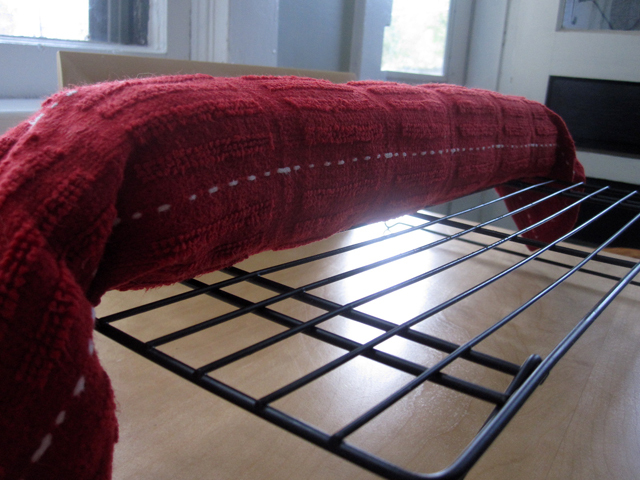 Carefully and slowly roll the towel and cake lengthwise – like you’re rolling up a sleeping bag, but the long way. 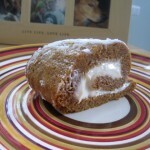 Place the rolled cake on a cooling rack and let it cool for about 20 minutes. This is a great time to make the icing. Blend the cream cheese, butter, vanilla and sugar. 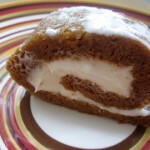 Unroll the cake carefully and spread icing on the inside. Roll it back up without the towel. 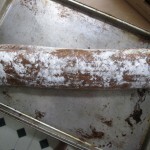 Wrap the whole roll in plastic wrap and refrigerate until completely cooled. Slice it up and serve!